Habit: Shrub or small tree <= 3 m, rounded. Stem: densely leafy, green. Leaf: alternate, generally 1--2 cm, narrowly linear, thick, generally entire, glabrous, gland-dotted, resin-varnished. Inflorescence: head 1, discoid; peduncle 8--25 mm, leafy-bracted; involucre cylindric or obconic to bell-shaped; phyllaries 9--18 in 1--2 series, 8--12 mm, linear to lanceolate, thick, acuminate, gland-dotted near tip, margins often scarious; receptacle flat, epaleate. 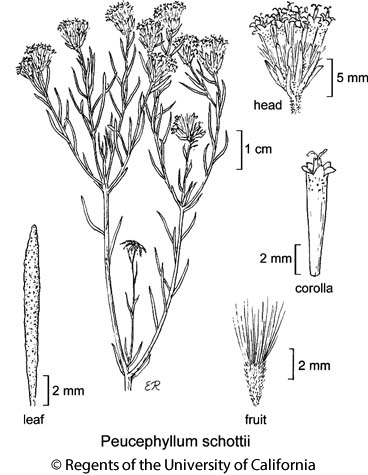 Flower: 12--21; corolla 6.5--8.5 mm, pale yellow, sometimes distally +- purple, tube << throat; anther base weakly tailed, tip lanceolate to ovate; style branches minutely papillate, rounded-truncate. Fruit: 3--4 mm, narrowly obconic, weakly angled, +- black, bristly; pappus of 30--60 fine bristles, 2--5 mm (sometimes also 15--20 slender scales 4--6 mm), straw-colored to red-brown. Chromosomes: 2n=20. Citation for this treatment: David J. Keil 2012, Peucephyllum schottii, in Jepson Flora Project (eds.) Jepson eFlora, http://ucjeps.berkeley.edu/eflora/eflora_display.php?tid=4355, accessed on April 23, 2019.